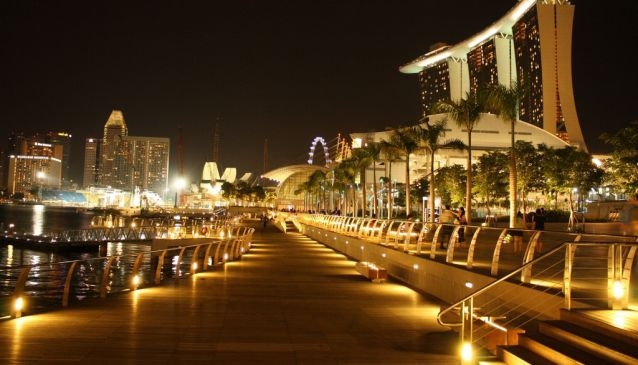 Situated along the touristic Marina Bay precinct, The Promontory Walkway stretches from Marina Boulevard to the ArtScience Museum passing by The Promontory @ Marina Bay, Marina Bay City Gallery and The Shoppes at Marina Bay Sands. The long and wide boardwalk is action-packed all year around and is a popular magnet for both tourists and locals. It offers a stunning setting, admist breathtaking skycrapers and vista of the bay, for a relaxing stroll for lovers, friends and families. And if you come at night, make a halt along the way to watch the free Wonder Full Water and Laser Show. The Pronontory Walkway is made up of 8 spaces, which vary in size from 611 to 1518 sqfm and are often used for temporary public art exhibitions. Art works are displayed there for a period between one and three months and should be suitable to the overall architecture and design of the adjacents buildings and places.